What a great way to start off the day for your valentine. 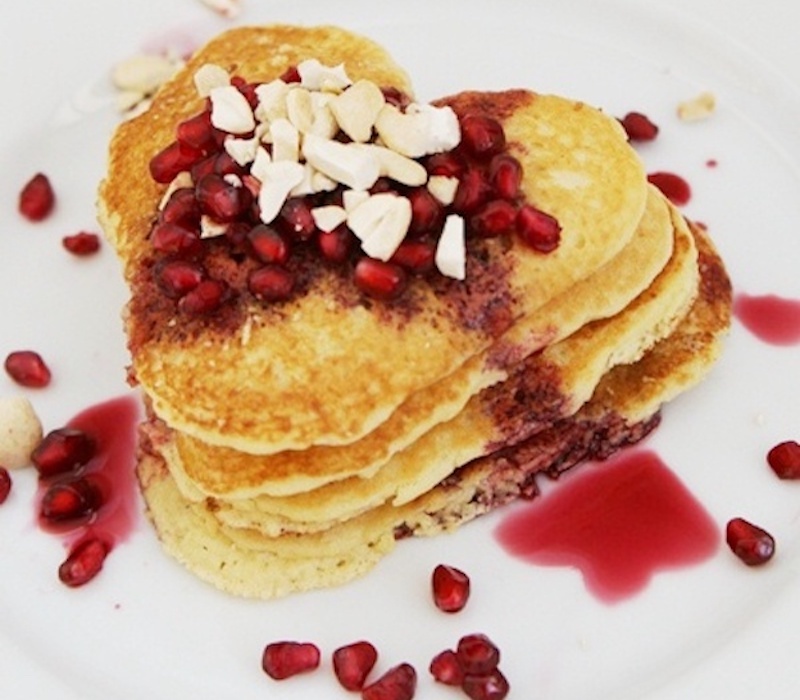 Breakfast served in bed with this keto friendly pancake recipe fashioned into hearts with a pomegranate dressing for color! Pour pomegranate juice into a small sauce pan and bring to a gentle boil. Reduce heat to a simmer and allow juice to reduce by half. While syrup is reducing, in a mixing bowl, whisk the eggs then add the almond milk and vanilla extract and mix. Add the almond flour, salt and baking powder And mix until smooth. Heat a large skillet just above medium heat and add just enough oil to lightly coat the pan. Pour batter in heart shapes onto the skillet. Cook until the sides of the pancakes firm up and a bubble or two escapes from the top. Flip, cook an additional 45 seconds to 1 minute then repeat with remaining batter.